ELE08 gave me permission to post for use with MEUITM. Please ask ELE08 over on BSN if you want to edit and release this file. For use with ME3Explorer (it's easy) to install ELE08's eyelashes in ME1 and ME2. Say goodbye to texmod. Granted, texmod version is still available if you want. Ottemis has great instructions here for how to use Texmod to use a tpf file. 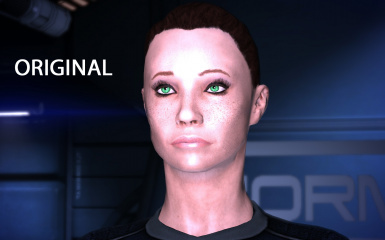 You can read about it under the section: How to launch Mass Effect (1/2/3) with Texmod. But again, try ME3Explorer. The zip file has a link to the setup of ME3Explorer and written instructions for how to replace the file.